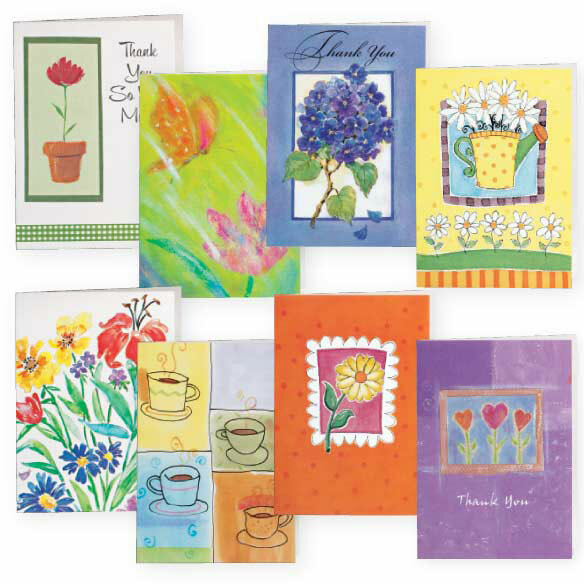 Value pack of thank you and blank note cards comes with 24 cards, in 8 unique designs. Each card single folds to 4 1/8" x 5 3/8"; white envelopes included with blank thank you cards. I've used them all already. They really came in handy. Thanks. They were smaller than expected but were real nice cards. Great for a quick Thank you note. These are wonderful to have handy when you need to send a card and cannot get out. The variety allows you different options. They are attractive to send to family or friends. Getting them on sale was an added blessing! Having these cards on had makes it easy to send a quick Thank You note. Looked like good value for the price. My Aunt cannot get out to buy cards to send. The variety supply of kindness cards seems ideal for an avid noe writer as myself. I LOVE SENDING CARDS. THESE ARE PRETTY.